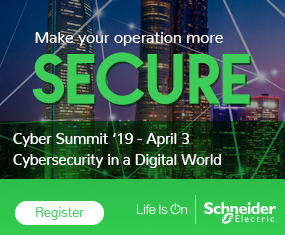 Cyber security awareness continues to grow and Rockwell Automation remains focused on security in the plant environment. Users know they have to do something, but they just seem to want to focus on producing product and let someone else worry about securing the environment. That is where Rockwell’s managed services program comes into play. It can help ensure continued uptime with the provider assessing, designing, implementing, and continuously monitoring a solution for the individual organization. After all, consistent uptime is the goal of any manufacturer and monitoring the system 24 hours a day is one way to keep the enterprise up and running. Part of the program allows for constant logging of any access and it also records sessions, said Douglas Weber, business manager at Rockwell Automation during Wednesday’s opening day at Rockwell’s annual Automation Fair 2014 in Anaheim, CA. The program offers virtual support with continuous monitoring, secure remote access and SSL tunneling technology, said Shawn Boike, senior systems engineer at Rockwell. The program brings in data to the service center. In showing how secure the environment is, Boike explained how they secure the environment. The devices on the plant floor, or out in a remote location, connect to a device that connects into the DMZ via a firewall which then connects to another device in the DMZ. That device then connects out to the service center via a 128-bit encryption. This ensures there is no one direct connection. “We have been doing this with ourselves and our customers and we have never witnessed a break in data,” Boike said. During a quick demo, Boike showed the communication level the user would receive if an incident occurred. If a connection ended up lost and the user did not realize what happened, he would receive a text message and then a follow up phone call just to warn him of the lost connection. The program can help ensure continued uptime with the provider assessing, designing, implementing, and continuously monitoring a solution for the individual organization. In addition, there will be proactive defense in a continuous monitoring and analysis of the system. This way the manufacturer can focus on continuing the task of keeping the process in control and making more product.